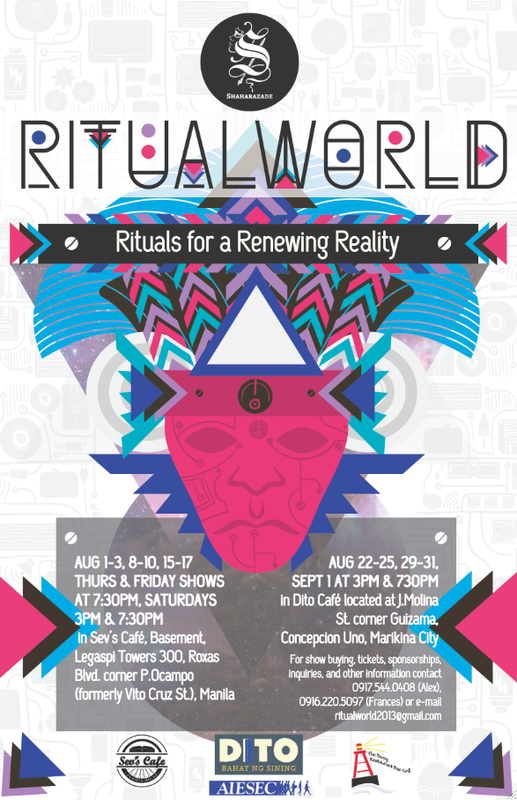 This August, Shaharazade Theater Company is set to open their third production for the season, Ritual World and embrace audiences in the creation of (new) rituals. Ritual World is a brave, new theater piece that will facilitate an actual ritual with the audience and bring them on a journey of self-revelation and transcendence. Gathering five different individuals from around the globe: Philippines, Cameroon, Romania, China, and Kyrgyztan, rediscovering rituals and having the audience actually participate in the different ceremonies within the play. It is an ivitation for both performers and audiences to discover, create, and define rituals for a renewing reality. RitualWorld aims to explore what it means to be human in our rapidly changing, technology-driven, and globally interconnected society. Shaharazade is a new and upcoming independent theater group composed of theater artists from various companies and universities in the metro. It is their mission to bring back the art of storytelling through the medium of theater, contributing to the flourishing independent art scene in Manila. Ritual World performances are on August 1-3, 8-10, 15-17 in Sev’s Café, Basement, Legaspi Towers 300, Roxas Blvd. corner P.Ocampo (formerly Vito Cruz St.), Manila with Thursday and Friday shows at 7:30pm, Saturdays 3pm & 7:30pm; August 22-25, 29-31, September 1 at 3pm & 730pm in Dito Café located at J.Molina St. corner Guizama, Concepcion Uno, Marikina City . LIKE RITUAL WORLD’s Community Page on Facebook to get updates on the show’s progress.